Snickerdoodles, plus chocolate chip, oatmeal raisin, and peanut butter cookies--aren't these what come to mind when we think of classic American cookies? I know they're the ones that I "helped" my mom bake when I was little. I've featured all of them except for good ol' peanut butter, complete with criss-cross pattern on top. I didn't plan it this way, but I found out shortly after I had started writing this post that a member of Kris Kross, a rapping duo that had a few hit songs in the 90s, passed away. Shame. In brighter criss-cross news, Liz Lemon's affable love interest on 30 Rock was called Criss Chros, and he was terrific. Nobody has cheekbones like James Marsden. These are exactly what you'd expect when thinking about classic peanut butter cookies. They're a little crispy on the exterior, thanks especially to a coating of sugar, but the innards are soft. The flavor of peanut butter is strong, which is as it should be. The cookies flatten out even without the help of the pre-bake push-down that comes with making the criss-cross pattern, but it's still a necessary step. For nostalgia. Preheat oven to 350 degrees F. Spray baking sheets with cooking spray or line with a silicone mat. In a large bowl, whisk together the flour, baking soda, and salt, set aside. In a stand mixer (or with an electric mixer), beat together the brown sugar, sugar, butter, and oil until light and fluffy. Add the eggs and vanilla and beat until evenly incorporated. Beat in the peanut butter and then gradually stir or slowly beat in the flour mixture until evenly incorporated. Refrigerate the dough for 15 minutes or until firmed slightly. Shape portions of the dough into golf ball-sized balls with lightly greased hands. Roll each ball in sugar and place on the baking sheets about 3 inches apart. Using a fork, firmly press down each ball horizontally and then vertically until the ball is flattened to about 1/2 inch thick. Bake for 9-12 minutes or until tinged brown at the edges and just beginning to firm up in the centers, being careful not to overbake. Reverse the baking sheets halfway through the baking to ensure even browning. Remove from oven and allow to cool on the baking sheet for 3-4 minutes, then transfer to a wire rack to cool completely. These look wonderful. I wish my husband liked peanut butter more! They must have the criss cross. when I read this I thought it had applesauce in it as well. Wouldn't that be a great idea? 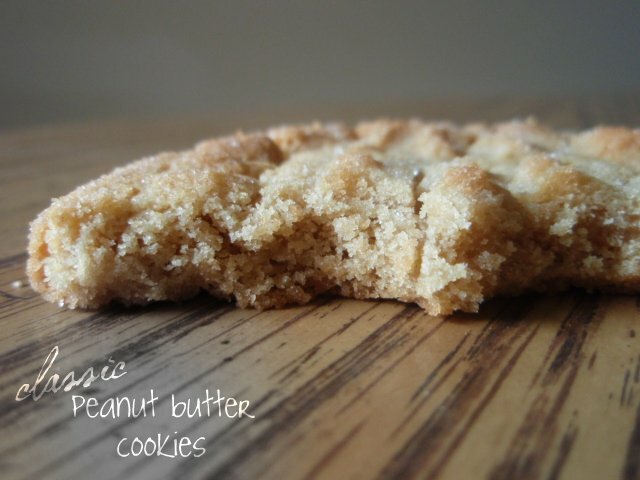 I love a good criss-cross on a peanut butter cookie! Just yesterday, I was thinking that I should bake some peanut butter cookies soon. Now, I must. I haven't had a peanut butter cookie for way too long. They look fabulous. These cookies look so good,Grace! My kids would love them! These are my future son-in-laws favourite. Definitely my "go-to"cookie when in doubt. I add 1/2 cup oatmeal to the batter.... from my mom-in-laws recipe... tastes great, but MUST have the criss cross lines! Everything is better when sugar-coated. Love that touch with your recipe. I'll have to try that next time. Only recently did I make peanut butter cookies and I loved every bite of them! I am sure I would enjoy these little ones as well as they look totally delicious! These sound wonderful :) I bet they taste heavenly! You've hit on my favorite cookie! With a glass of cold milk, I could eat a plateful. Haven't made them in ages. Yum. Double yum. We worship the peanut butter! These cookies look divine!